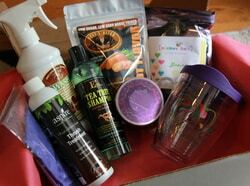 If you love the idea of getting a box filled with equine surprises, then you need to know about Giddy-Up Goodies. It’s a monthly subscription box filled with items like grooming supplies, treats, rider surprises, show necessities and more. Giddy-Up Goodies partners with high quality brands and looks for up-and-coming must-have items. Each box contains a retail value of $60-$100 in goods! Now if someone asks you what you want for the holidays or your birthday, you can tell them you want a Giddy-Up Goodies box! Win a 3 month box! Soon you'll be able to enter to win a 3-month Giddy-Up Goodies subscription box in our next contest. Details coming soon. Your turn! Equine Product Submission.